This plaque was probably made in Birmingham, the main centre of metalworking in 18th-century England. Throughout the second half of the century, Birmingham was also the heart of a region famed for the manufacture of enamels. John Brooks, who claimed to have invented the technique of transfer-printing on enamel, and whose work this probably is, lived in Birmingham in the early 1750s. 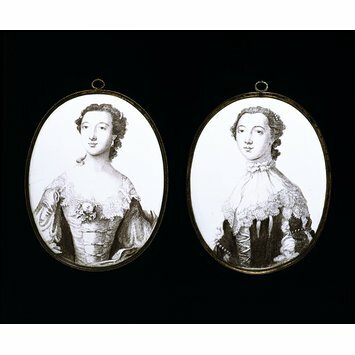 After moving to London as partner in the short-lived Battersea factory, Brooks produced smaller, more delicate versions of the Gunning Sisters plaques. The Irish beauties Maria Gunning (1733-1760) and her sister Elizabeth arrived in England without fortune or title in 1750. 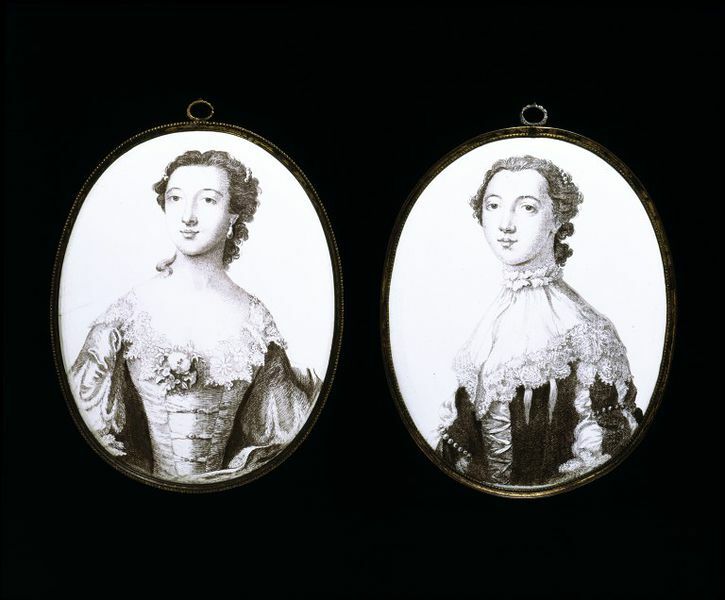 The 'gorgeous Gunnings' took London by storm and were constantly followed by mobs of admirers. By the spring of 1752, both had married aristocrats. Maria married George William, 6th Earl of Coventry. Though naïve and silly, she was considered prettier than her sister. It is probably she who is depicted on another transfer-printed enamel as the personification of Ireland Being Awarded the Prize of Beauty. But Maria's looks were destroyed by a combination of tuberculosis and slow poisoning. The white lead (possibly also arsenic) in the face powder she used to whiten her skin caused her death at only 27. Around 10,000 people are said to have come to view her coffin.